My father was the first big sports fan in my life. 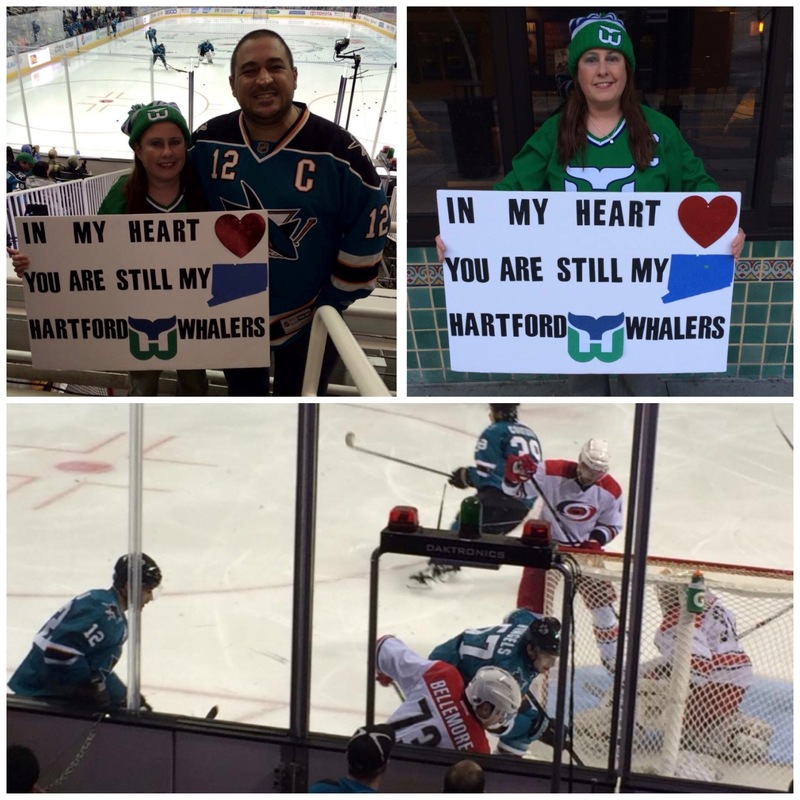 He loved all sports especially hockey as he lived one town over from the home of the Hartford Whalers. The team was not a good one, I remember them losing home more games we attended than they won and they never won the Stanley Cup, yet he was a loyal fan. 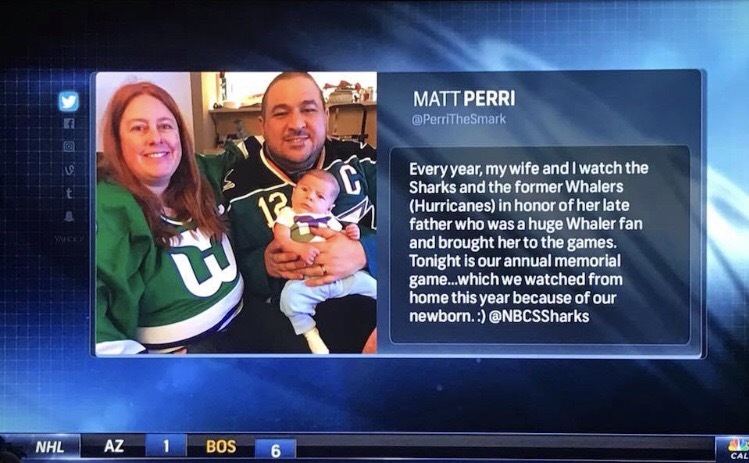 His devotion sparked an annual tradition for Matt and I of seeing the San Jose Sharks play the team the Whalers became, the Carolina Hurricanes. Each year we have gone has brought special memories. 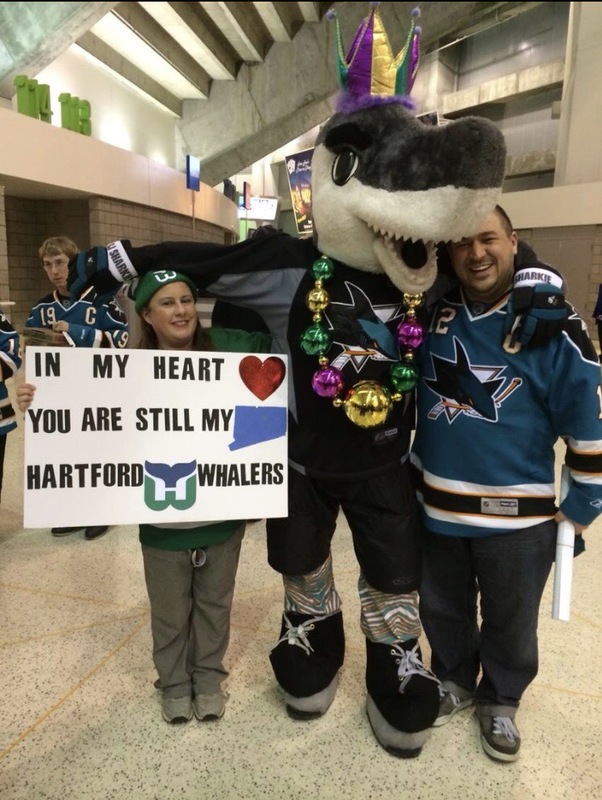 Two years ago we met Sharks’ mascot Sharkie, who was dressed up for Madris Gras. I brought a sign for the first time to any sporting event and as had wonderful seats. 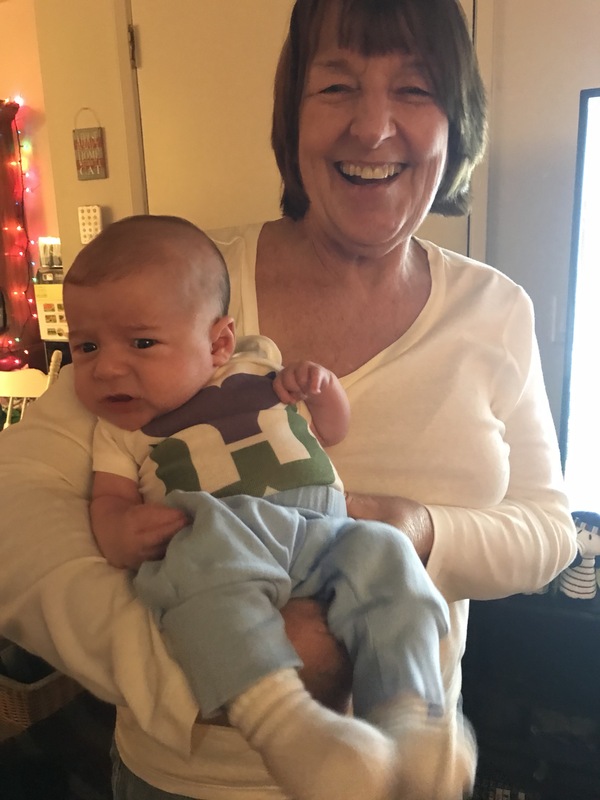 We did consider going to the game this year, and after careful consideration decided while we would to go it would be hard to do so with a newborn, especially as strollers are not allowed at the stadium. Instead we had a game watching party at our apartment. 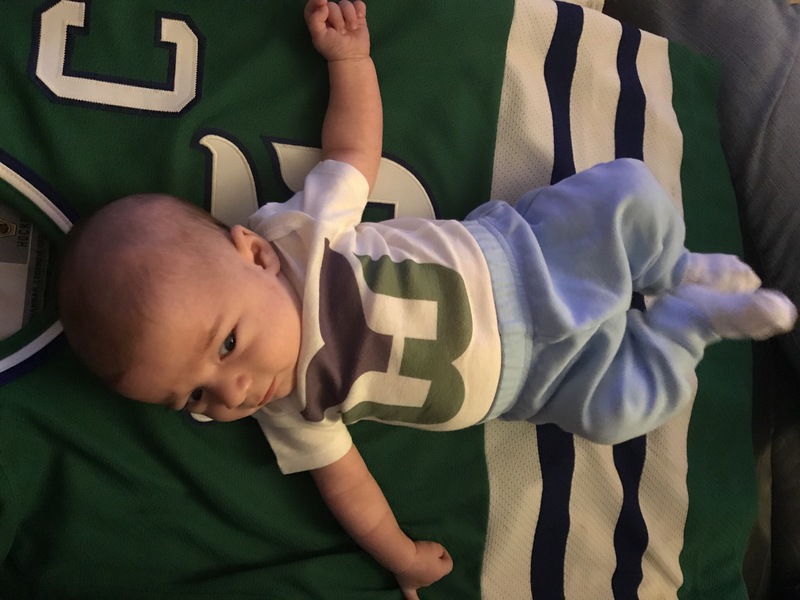 William wore a special Whalers onesie gifted to us by Scott and Jennie (along with other great gifts for our baby shower, each whale themed). 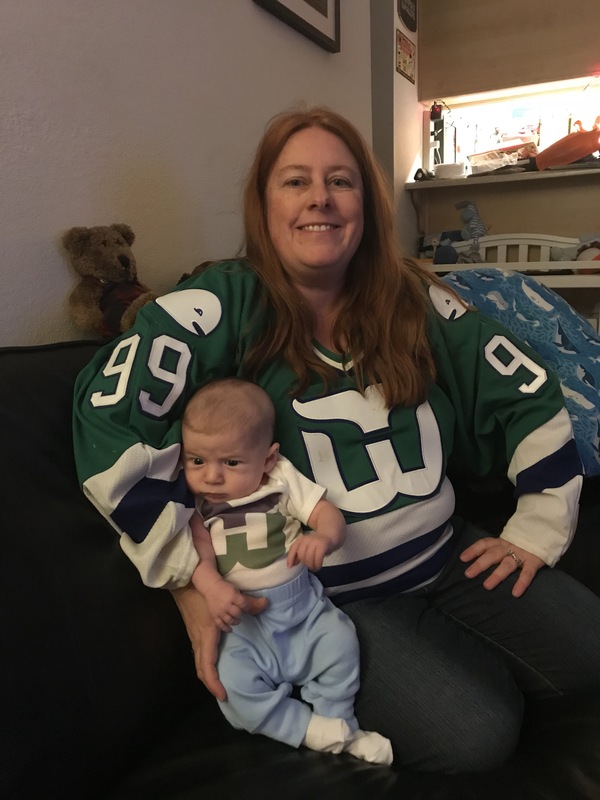 I had fun posing William on my custom Whalers jersey that was one of my Christmas gifts from Matt many years ago. William’s onesie looks so great next to me. He has his serious game face on for this photo. We did try to get him to watch the game, however, he only looked at the screen here and there. 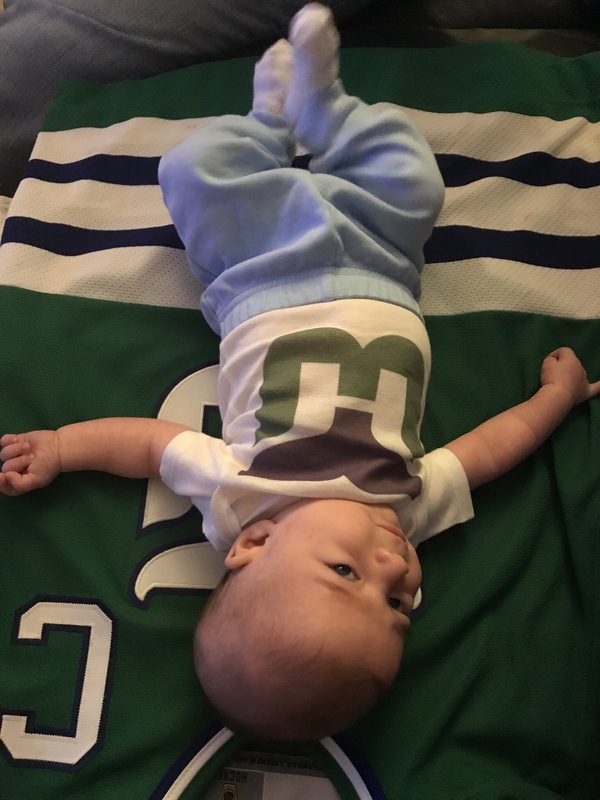 At one point he was crying for milk and he fell asleep way before the overtime started. 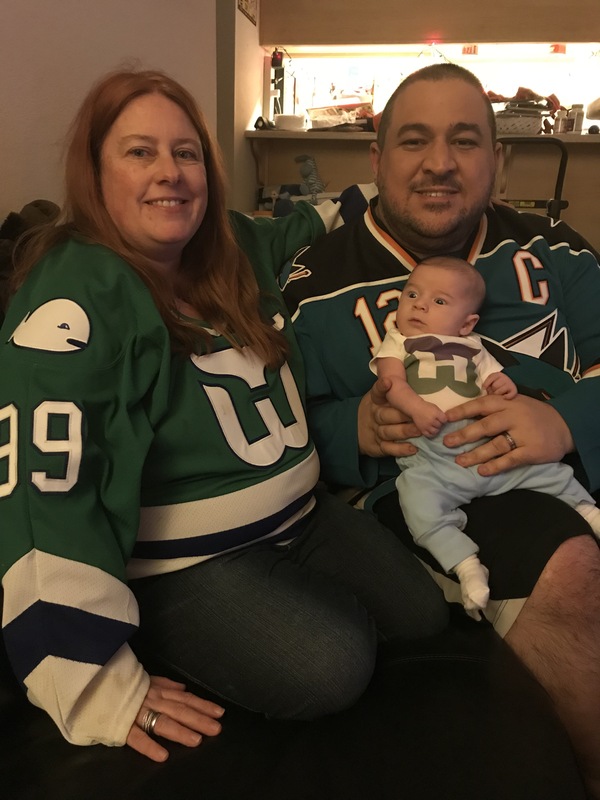 While it was an exciting game with the Sharks making an amazing comeback and winning, it’s a good thing we watched at home. 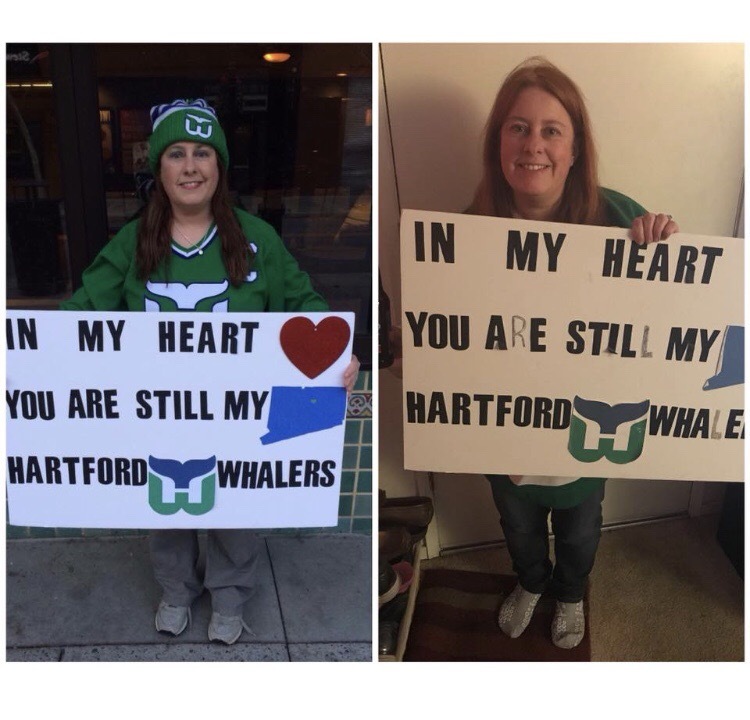 To complete the memory look back, o had Matt take a picture of my sign now which is missing a heart and letters, the latter of which Matt filled in with a marker. I had had Matt tape the game in case we got in late from looking at Christmas lights. He taped it and the post show, which turned out to be amazing good luck. During the game, the local television station had asked those watching at home to tweet about it with pictures. To our surprise and delight, the tweet of all three of us was the last one read. With the show taped, we could record a photo and video of the day our tweet was shared with the world. I can’t wait till the day we can take William to our memorial game in person.